The title caught my attention immediately. How and why would something so delicate and beautiful be forbidden? What are the ruins of lace? The events of this historical fiction set in France and Flanders (Belgium) of the 17th century are seen through the eyes of several people, including lace-maker Katharina, her sister Heilwich, soldier Denis Boulanger, dutiful daughter, Lisette Lefort, lover of lace The Count of Montreau, Andre Lefort, lover of Lisette, and a dog! Lace is the driving forced between all of the characters, some of whom never meet, while others cross paths as the story progresses. This quirky and sometimes funny novel delves into the lace-making trade of the 1600’s in a nunnery in Belgium, renowned center of exquisite hand-made lace. “Lace is created from thread. Threads. Many of them. Twisted and crossed, looped and whorled, knotted and woven. But lace is formed from the absence of substance; it is imagined in the spaces between the threads. Lace is a thing like hope. It lived, it survived, and it was desired for what it was not. If faith, as the nuns said, was the substance of things hoped for, then lace was the outline – the suggestion-of things not seen,” says Katharina poetically. Everyone of wealth and station wears lace - men, women, bishops, and royalty. For some reason not adequately explained in the story, King Louis XIII bans lace in France and as a result, it becomes the most valuable contraband of the time, smuggled into France from Flanders for everyone knows that Flemish lace is the best. It is given in payment for gambling debts, traded in exchange for lives, lands, and souls. Extreme measures are taken to make lace, get lace, and steal lace, which is then smuggled into France in loaves of bread, on dogs that were subsequently killed, and in coffins! Iris Anthony develops well-rounded characters from angst-ridden Lisette to slow-thinking Denis Boulanger. And who wouldn’t sympathize with the dog! Actually he is my favorite character. The one downfall is the abrupt and surprise ending – a bit too soap opera-ish! 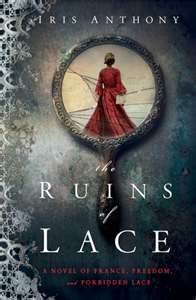 Other than that, it is an interesting read, especially if you enjoy historical fiction, and want to learn something about lace as well as the extent to which greed for a forbidden item drives people. Note: This book is rated C = clean read. Beware of descriptions of animal cruelty. It's not too late to enter the Gift Basket giveaway that ends today. It includes a gift from each character in the novel and a copy of the book. Watch for my interview with Iris Anthony tomorrow (Oct 17) with another giveaway of her book. Disclosure: Thanks to Beth Pelke for sending me this book for review. I was not compensated in any other way, nor told how to rate or review this product.